A refusal to toe the party line in communist Bulgaria led to polymath Dimitar Nenov being marginalized in life, and to posthumous neglect. But this is hugely enjoyable music, well worthy of revival in such fiercely committed performances as we find here. To the living we owe respect. Every epoch has its celebrities and heroes. Some of them attract attention and capture the imagination with ideas or actions, talents or abilities. Many happen to catch the essence of the politics, wealth, power, or various trends and fashions of the time. Sometimes ‘riding the wave’ propels artists upwards more immediately and tangibly than any profound artistic achievement or contribution. This can be particularly evident at times of political, social or economic unrest—when dissidents can become heroes, or celebrities outcasts, and a rise to stardom is not necessarily warranted by universal artistic values, particularly when the validity of those values is questioned and undermined. Further down the line, changing political and social climates can bring rehabilitation to artists formerly out of favour. Or their voices can remain silenced, as political directions change fast and the vested interests of social forces and global players outweigh any universal or artistic values. Pianist and composer, architect, pedagogue, radio producer and public figure, Dimitar Nenov (1901–1953) was a polymath of a rare magnitude. As a pianist he gave hundreds of critically acclaimed concerts in Germany (Berlin, Leipzig, Frankfurt, Dresden), Austria (Vienna, Salzburg), Italy (Rome, Bologna), the Czech Republic, Poland, Hungary, Serbia, Romania and his native Bulgaria. He performed piano concertos with many orchestras, recorded a wide catalogue of solo and concerto works in Germany, Hungary and Bulgaria, and was a juror at the 1949 Chopin International Piano Competition in Warsaw. As an architect he designed a number of public buildings in Bulgaria, including several railway stations and a baldachin above the main entrance of the iconic St Alexander Nevsky Cathedral in Sofia, since mysteriously disappeared. As the first Music Editor of Radio Sofia (later to become Bulgarian National Radio) he founded the first radio orchestra in the country (1930) and established for the station music commissioning, recording and broadcasting policies which were to become pivotal factors in the development of Bulgarian music and composers, and in preserving the musical heritage of the country, in line with the best European practices of the time. He wrote on music and was—together with other leading Bulgarian composers of the time such as Pancho Vladigerov, Marin Goleminov, Lubomir Pipkov and Veselin Stoyanov—a co-founder of the Contemporary Music Society (1933, later to become the Union of Bulgarian Composers). As a professor in piano at the Sofia State Conservatoire, he taught some of the notable Bulgarian pianists and composers of the next generation, including Lazar Nikolov and Trifon Silianovski. As a composer he developed a distinct personal style, encompassing a wide classical range, traditional Bulgarian heritage and contemporary developments of the day—not without rare visionary glimpses into the future. Among his most significant compositions are two symphonies, a piano concerto, two oratorios (Christmas and Thrace), the symphonic Rhapsodic Fantasy and Four Sketches, several vocal cycles, a piano sonata, Toccata, and Cinema Suite; numerous works remain unfinished. With the establishment of Communism in Bulgaria in 1944, Dimitar Nenov found himself in a highly unfavourable position. He had been born into the family of a general of the Tsar’s army. This automatically made him the object of suspicion, something further exacerbated by his educational history and the years he had spent across Europe. After his early piano studies with his mother and the renowned Bulgarian pianist Andrei Stoyanov, Nenov had studied architecture, piano, music theory and composition in Dresden, architecture and piano in Bologna, and finally with Egon Petri (a pupil of Ferruccio Busoni) in Poland. He had toured the Continent extensively as a pianist and spent years in Dresden as music director of a ballet company before returning to Bulgaria—during the period of the last Bulgarian Kingdom—to hold key positions both as musician and architect. And if these suspiciously bourgeois elements in Nenov’s biography were not enough, he did not compose a single note in praise of the Communist Party, a rare feat amongst the influential Bulgarian composers of the time. Consequences soon followed. In the pages of the official Soviet Music magazine, no less a person than Aram Khachaturian criticized Nenov and specifically his Rhapsodic Fantasy for being ‘influenced by Western modernism’ and ‘exhibiting features of Impressionism, cosmopolitanism’. Although Bulgaria was not a member of the Soviet Union, such signals from Moscow were received with a reverence sometimes greater than that accorded them in the Union itself. All recordings of Nenov at Bulgarian National Radio were destroyed on the orders of its then director Nayden Naydenov. Over at Hungarian National Radio just one recording with Nenov as soloist—Liszt’s second piano concerto—survived. The unpublished autograph score of Nenov’s oratorio Christmas was saved from being burnt at Bulgarian National Radio, but only by accident. His personal archive was ‘cleansed’, a number of surviving manuscript scores and personal documents showing signs of deliberate tampering. After the first, most fierce period of the regime, Nenov saw something of a rehabilitation—he was even awarded the state Dimitrov Prize the year before his death. However, it is clear that years of hostility and humiliation had taken their toll, and when Nenov died in 1953 a pall of obscurity remained over both his music and his personality. To this day his compositions remain unknown outside Bulgaria. With the division of Europe, Western orchestras largely ceased to perform music by Bulgarian composers. The works of Vladigerov, Pipkov, Goleminov and Nenov had previously featured in the concert programmes of many of them, including the Berlin and Vienna Philharmonic Orchestras, the London Symphony Orchestra and the Philadelphia Orchestra. For half a century, orchestras on the Eastern side of the Iron Curtain occasionally featured Bulgarian music, but Nenov’s works remained confined to Bulgaria itself, being considered ‘unsuitable’ to represent the country abroad. Nothing was to change after the fall of Communism in 1989. 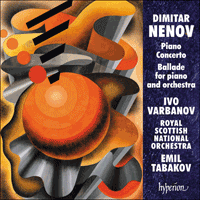 This album features two of Nenov’s largest and most representative works and is their first commercial recording (preceded only by several Bulgarian radio recordings). 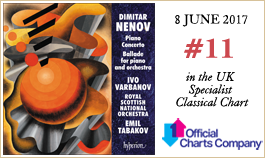 The Royal Scottish National Orchestra is the first outside Bulgaria to undertake a recording of Nenov’s music, a project instigated by London-based Bulgarian pianist Ivo Varbanov. Printed parts and scores were commissioned for the recording by the pianist himself—these works remain unpublished, and all pre-existing parts were handwritten. Dimitar Nenov’s Piano Concerto, completed in 1936, was premiered in Belgrade the following year with the composer as soloist. It is a monumental work that pushes the classical and romantic traditions of sonata form and thematic development to their limits. It connects them with contemporary trends of objectivity and constructivism in an aesthetic symbiosis of late romantic and early modern trends, and is imbued with the melodic vocabulary of traditional Bulgarian music in a subtle, yet recognizable and personal way. Rather than merely displaying the solo instrument over an orchestral background, this virtuosic concerto integrates the solo part within a symphonic whole in a manner similar to that found in the piano concertos by Brahms, Rachmaninov or Bartók. Drawing on the traditions of the instrument and the genre—including those from the piano concertos of Beethoven, Brahms, Rachmaninov, Liszt, Scriabin and others—the solo part embraces further developments: polymodal and polytonal explorations, sound fields and cluster sonorities, percussive effects, and jazz influences. The work is conceived in one continuous movement, which can be divided into three sections. This both pays a nod to the traditional three-movement piano concerto, while also exhibiting rare and innovative structural developments. The first section opens with an ecstatic theme, to become one of the landmarks of the concerto. Constructed in sonata form without recapitulation, this section displays a degree of freedom more typically characteristic of a rhapsody or improvisation. The main subject is contrasted with a very simple second motif in the Lydian mode, which then permeates the second and third sections of the concerto, so establishing itself as a second main idea of the work. The second section is a lyrical contemplation on the Bulgarian folk song Я разтуяй, цвето моме, магиите (‘Break the spells, O Tzveta maid’), a dark ballad about unrequited love with features that are typical and unique to the region—the characteristic modal modulations and the ‘measureless’ melodic line, free from perceivable metric constraints. This theme undergoes a rigorous development in multiple variations, many of which are very different from the original, to the point where connections with it become unrecognizable. Some examples are the Brahmsian chorale of the solo piano with apparent liturgical connotations, the contrasting—and menacing—military march, and several dance-like episodes. The sheer diversity of these variations, all based on the same folk song, is testimony to Nenov’s imagination and technical proficiency. The third section of the concerto resembles a scherzo-finale, its whimsical theme being a remote, albeit clearly distinguishable, variation of the opening theme of the first section. The general climax is a recapitulation of the memorable chorale from the middle adagio section, now triumphant as an ecstatic orchestral celebration. The dream-like coda, reminiscent of celebratory Eastern-Orthodox bell-ringing, combines motifs from the three main themes of the concerto: the two ideas from the opening section and the folk song from the middle section. Thus the whole continuous movement of this concerto is built as a single over-arching sonata form of gigantic dimensions, exceeding even those achieved in the symphonies of Mahler and Bruckner—although longer as a whole, these symphonies consist of several movements, some of them in sonata form, whereas here the concerto is conveyed as a single continuous sonata form spanning nearly forty-five minutes. Perhaps such an immense, cathedral-like edifice should not be so surprising: this is, after all, the work of a composer who was also a professional architect. The Ballade No 2 for piano and orchestra—written in 1942/3 and premiered posthumously by two of Nenov’s pupils, pianist Todor Kiuvliev and conductor Ivan Bakalov—was considered by the composer to be his ‘most Bulgarian work’. The piece opens with a dream-like introduction reminiscent of a Bulgarian folk song of meditative, pastoral nature. This is followed by a colourful rhapsody, composed in a clear ternary form. The outer sections of this rhapsody are imbued with the stylized yet unmistakable atmosphere of Bulgarian folk dances, ranging from witty and humorous to boisterous and rough. These are contrasted with a serenely beautiful middle section, corresponding to the introduction, yet building to a strikingly intense, fiery and epic climax—one perhaps related to Bulgaria’s turbulent history and revolutionary struggle against the Ottoman oppressors, a central theme in many folk and nineteenth-century ballads which may have lodged in Nenov’s imagination. Despite the use of a number of contrasting ideas in the three main sections of the Ballade, the simple song melody of the introduction is the seed from which all the main themes and motifs are developed throughout the piece, like a kernel from which the whole tree has grown. This seemingly free rhapsodic fantasy is in fact a highly organized monothematic composition, another rigorous invention of this composer-architect. Pianiste et compositeur, architecte, pédagogue, producteur de radio et personnalité publique, Dimitar Nenov (1901–1953) fut un esprit universel d’une rare grandeur. Comme pianiste, il donna des centaines de concerts encensés par la critique en Allemagne (Berlin, Leipzig, Francfort, Dresde), Autriche (Vienne, Salzbourg), Italie (Rome, Bologne), République tchèque, Pologne, Hongrie, Serbie, Roumanie et dans sa Bulgarie natale. Il joua en concerto avec de nombreux orchestres, enregistra un vaste catalogue d’œuvres pour piano seul et de concertos en Allemagne, Hongrie et Bulgarie, et fut membre du jury du Concours international de piano Chopin à Varsovie en 1949. Comme architecte, il conçut un certain nombre de bâtiments publics en Bulgarie, notamment plusieurs stations de métro et un baldaquin au-dessus de l’entrée principale de l’emblématique cathédrale Saint-Alexandre Nevski de Sofia, qui disparut mystérieusement. Comme premier rédacteur musical de la Radio de Sofia (qui allait devenir par la suite la Radio nationale bulgare), il fonda le premier orchestre de radio du pays (1930) et mit en place pour cette radio une politique de commandes, d’enregistrements et de diffusion de la musique qui allaient devenir des facteurs essentiels dans le développement de la musique et des compositeurs bulgares, ainsi que dans la préservation de l’héritage musical du pays, dans la ligne des meilleures pratiques européennes de l’époque. Il écrivit sur la musique et fut cofondateur de la Société de musique contemporaine (1933, qui allait devenir l’Union des compositeurs bulgares) avec d’autres grands compositeurs bulgares de l’époque comme Pantcho Vladiguerov, Marin Goleminov, Lubomir Pipkov et Vesselin Stoyanov. Professeur de piano au Conservatoire d’État de Sofia, il prodigua son enseignement à certains des plus éminents pianistes et compositeurs bulgares de la génération suivante, notamment Lazar Nikolov et Trifon Silianovski. Le compositeur développa un style personnel spécifique, couvrant une large gamme classique, l’héritage bulgare traditionnel et les évolutions contemporaines de l’époque—non sans quelques aperçus visionnaires de l’avenir. Parmi ses œuvres les plus importantes figurent deux symphonies, un concerto pour piano, deux oratorios (Noël et Thrace), la Fantaisie rhapsodique pour orchestre et Quatre Esquisses symphoniques, plusieurs cycles vocaux, une sonate pour piano, la Toccata et la Cinema Suite, ainsi que beaucoup d’œuvres inachevées. Avec l’instauration du communisme en Bulgarie en 1944, Dimitar Nenov se trouva dans une situation très inconfortable. Il était né dans la famille d’un général de l’armée du tsar, ce qui le rendit automatiquement suspect, situation exacerbée encore davantage par son passé pédagogique et les années au cours desquelles il avait séjourné en Europe. Après avoir commencé à travailler le piano avec sa mère et avec le célèbre pianiste bulgare Andrei Stoyanov, Nenov avait étudié l’architecture, le piano, la théorie musicale et la composition à Dresde, l’architecture et le piano à Bologne et finalement avec Egon Petri (élève de Ferruccio Busoni) en Pologne. Il avait fait beaucoup de tournées en Europe comme pianiste et passé plusieurs années à Dresde comme directeur musical d’une troupe de ballet avant de retourner en Bulgarie—à l’époque de la dernière royauté bulgare—pour occuper des positions clefs dans la musique et l’architecture. Et si ces éléments de la biographie de Nenov ne suffisaient pas (il y avait déjà largement de quoi le suspecter de «bourgeoisie»), il faut ajouter qu’il ne composa pas une seule note à la louange du Parti communiste, rare exploit parmi les compositeurs bulgares influents de l’époque. Les conséquences ne se firent pas attendre. Dans les pages de la revue officielle Musique soviétique, c’est Aram Khatchatourian lui-même qui critiqua Nenov et sa Fantaisie rhapsodique, l’accusant d’être «influencée par le modernisme occidental» et «manifestant des caractéristiques de l’impressionisme, du cosmopolitisme». Si la Bulgarie n’était pas membre de l’Union soviétique, les signaux en provenance de Moscou y étaient néanmoins reçus avec un respect parfois plus grand que celui qui leur était accordé au sein de l’Union elle-même. Tous les enregistrements de Nenov à la Radio nationale bulgare furent détruits sur ordre de son directeur de l’époque, Nayden Naydenov. À la Radio nationale hongroise, un seul enregistrement avec Nenov en soliste—le Concerto pour piano nº 2 de Liszt—a survécu. La partition autographe inédite de l’oratorio Noël de Nenov fut sauvée du feu à la Radio nationale bulgare, mais seulement par accident. Ses archives personnelles furent «nettoyées», un certain nombre de partitions manuscrites et de documents personnels qui nous sont parvenus montrant des signes de falsification délibérée. Après la première période du régime, la plus terrible, Nenov connut une certaine réhabilitation—il reçut même le Prix d’État Dimitrov avant sa mort. Toutefois, il est clair que les années d’hostilité et d’humiliation avaient fait des ravages et après la mort de Nenov en 1953, un voile continua à maintenir sa musique comme sa personnalité dans l’obscurité. À ce jour, ses compositions restent inconnues hors de Bulgarie. Avec la division de l’Europe, les orchestres occidentaux cessèrent pratiquement de jouer la musique des compositeurs bulgares. Autrefois, les œuvres de Vladiguerov, Pipkov, Goleminov et Nenov figuraient aux programmes des concerts d’un grand nombre d’entre eux, notamment des orchestres philharmoniques de Berlin et de Vienne, de l’Orchestre symphonique de Londres et de l’Orchestre de Philadelphie. Pendant un demi-siècle, les orchestres situés à l’est du Rideau de fer jouèrent de temps en temps de la musique bulgare, mais les œuvres de Nenov restèrent confinées à la Bulgarie, étant jugées «peu appropriées» pour représenter le pays à l’étranger. Rien n’allait changer après la chute du communisme en 1989. Cet album présente deux des œuvres les plus vastes et les plus représentatives de Nenov; il s’agit de leur premier enregistrement commercial (précédé seulement par plusieurs enregistrements radiophoniques bulgares). Le Royal Scottish National Orchestra est le premier orchestre en dehors de la Bulgarie à entreprendre un enregistrement de musique de Nenov, un projet dont le pianiste bulgare Ivo Varbanov, basé à Londres et soliste en l’occurrence, est l’instigateur. Les parties et partitions imprimées furent commandées par le pianiste lui-même pour les séances d’enregistrement—ces œuvres restent inédites et toutes les parties préexistantes étaient manuscrites. Le Concerto pour piano de Dimitar Nenov, achevé en 1936, fut créé à Belgrade l’année suivante avec le compositeur en soliste. C’est une œuvre monumentale qui repousse les traditions classiques et romantiques de la forme sonate et du développement thématique au-delà de leurs limites. Elles y sont reliées aux tendances contemporaines d’objectivité et de constructivisme dans une symbiose esthétique des tendances de la fin du romantisme et du début de l’ère moderne : cette œuvre est imprégnée du vocabulaire mélodique de la musique bulgare traditionnelle d’une manière personnelle subtile et pourtant reconnaissable. Au lieu de se contenter d’exhiber l’instrument soliste sur un fond sonore orchestral, ce concerto virtuose intègre la partie soliste au sein d’un tout symphonique à la manière des concertos pour piano de Brahms, Rachmaninov ou Bartók. S’appuyant sur les traditions de l’instrument et du genre du concerto pour piano—notamment ceux de Beethoven, Brahms, Rachmaninov, Liszt, Scriabine, et d’autres compositeurs—la partie soliste comporte d’autres développements: des explorations polymodales et polytonales, des champs sonores et des sonorités de clusters, des effets percussifs et des influences du jazz. Cette œuvre est conçue en un seul mouvement continu, qui peut se diviser en trois sections, ce qui est un clin d’œil au concerto pour piano tripartite, tout en présentant des développements structurels rares et novateurs. La première section débute par un thème extatique qui va devenir l’un des jalons du concerto. Construite en forme sonate sans réexposition, cette section fait preuve d’un degré de liberté plus typiquement caractéristique d’une rhapsodie ou d’une improvisation. Le sujet principal est contrasté par un second motif très simple dans le mode lydien, qui imprègne ensuite la deuxième et la troisième section du concerto, s’imposant ainsi comme seconde idée principale de l’œuvre. La deuxième section est une méditation lyrique sur la chanson traditionnelle bulgare Я разтуяй, цвето моме, магиите («Romps le charme, ô jeune Tzveta»), une ballade sombre sur l’amour sans retour avec des éléments typiques et propres à la région, comme les modulations modales caractéristiques et la ligne mélodique «non mesurée», libre de toute contrainte métrique perceptible. Ce thème fait l’objet d’un développement rigoureux dans de multiples variations, dont plusieurs sont très différentes de l’original, à tel point que les relations avec le thème deviennent méconnaissables: ainsi le choral brahmsien du piano solo avec des connotations liturgiques évidentes, la marche militaire contrastée—et menaçante—, et plusieurs épisodes de danse. La diversité même de ces variations, toutes basées sur la même chanson traditionnelle, atteste de l’imagination et de la maîtrise technique de Nenov. La troisième section du concerto ressemble à un scherzo-finale dont le thème fantaisiste est une variation éloignée, quoique clairement reconnaissable, du thème initial de la première section. Le sommet général est une réexposition du mémorable choral de la section adagio centrale, maintenant triomphale comme une célébration orchestrale extatique. La coda onirique, qui fait penser au carillon de fête de l’Église orthodoxe orientale, mélange des motifs des trois thèmes principaux du concerto: les deux idées de la section initiale et la chanson traditionnelle de la section centrale. Ainsi l’ensemble du mouvement ininterrompu de ce concerto est construit comme une forme sonate d’ensemble unique aux dimensions gigantesques, dépassant même celles atteintes dans les symphonies de Mahler et de Bruckner. Si ces dernières sont plus longues dans leur ensemble, elles se composent de plusieurs mouvements, dont certains en forme sonate, alors qu’ici le concerto est exprimé comme une seule forme sonate continue qui s’étend sur près de quarante-cinq minutes. Un édifice aussi immense aux dimensions de cathédrale n’a peut-être rien de très surprenant car, après tout, c’est l’œuvre d’un compositeur qui était aussi un architecte professionnel. La Ballade nº 2 pour piano et orchestre—écrite en 1942/43 et créée à titre posthume par deux élèves de Nenov, le pianiste Todor Kiuvliev et le chef d’orchestre Ivan Bakalov—était considérée par le compositeur comme son «œuvre la plus bulgare». Elle commence par une introduction onirique qui fait penser à une chanson traditionnelle bulgare de nature pastorale et méditative. Vient ensuite une rhapsodie haute en couleur, composée dans une forme ternaire précise. Les sections externes de cette rhapsodie baignent dans l’atmosphère stylisée et pourtant caractéristique des danses traditionnelles bulgares, allant du spirituel et humoristique au tumultueux et agité. Elles forment un contraste avec la section centrale d’une beauté sereine qui correspond à l’introduction mais s’élève jusqu’à un sommet épique, enflammé et d’une intensité frappante—peut-être un reflet de l’histoire turbulente de la Bulgarie et de sa lutte révolutionnaire contre les oppresseurs ottomans, thème central de nombreuses ballades traditionnelles et du dix-neuvième siècle qui s’était peut-être incrusté dans l’imagination de Nenov. Malgré l’utilisation de plusieurs idées contrastées dans les trois sections principales de la Ballade, la simple mélodie de l’introduction est le germe duquel découlent tous les thèmes et motifs principaux du début à la fin de l’œuvre, comme la graine à partir de laquelle tout l’arbre pousse. Cette fantaisie rhapsodique apparemment libre est en fait une composition monothématique très organisée, une autre invention rigoureuse de ce compositeur-architecte. Pianist und Komponist, Architekt, Pädagoge, Rundfunkproduzent und Person des öffentlichen Lebens: Dimitar Nenow (1901–1953) war ein Universalgenie, wie es nur wenige gab. Als Pianist gab er hunderte von der Presse bejubelte Konzerte—in Deutschland (Berlin, Leipzig, Frankfurt, Dresden), Österreich (Wien, Salzburg), Italien (Rom, Bologna), der Tschechischen Republik, Polen, Ungarn, Serbien, Rumänien und in seiner Heimat Bulgarien. Mit zahlreichen Orchestern trat er als Solist in Klavierkonzerten auf und spielte in Deutschland, Ungarn und Bulgarien ein großes Repertoire an konzertanten und solistischen Werken ein; beim Internationalen Chopin-Wettbewerb in Warschau 1949 war er Mitglied der Jury. Als Architekt entwarf er eine Reihe von Gebäuden in Bulgarien, darunter etliche Bahnhöfe sowie einen Baldachin über dem Haupteingang der berühmten Kathedrale St. Alexander Newsky in Sofia, der auf rätselhafte Weise verschwand. Als erster Musikredakteur bei Radio Sofia, dem späteren Bulgarischen Nationalrundfunk, gründete er 1930 das erste Rundfunkorchester des Landes und schuf die Grundlage für Kompositionsaufträge, Musikaufnahmen und -programme des Senders, die für die Weiterentwicklung der bulgarischen Musik und die Bewahrung der Volksmusik des Landes eine wichtige Rolle spielen sollten und den höchsten europäischen Maßstäben genügten. Er war Musikschriftsteller und 1933 Mitbegründer der Gesellschaft für zeitgenössische Musik—zusammen mit führenden Komponisten wie Pantscho Wladigerow, Marin Goleminow, Ljubomir Pipkow und Wesselin Stojanow—, aus der später die Bulgarische Komponistenunion hervorging. Als Klavierprofessor am Staatlichen Konservatorium Sofia unterrichtete er bedeutende bulgarische Pianisten der jüngeren Generation, u. a. Lasar Nikolow und Trifon Siljanowski. Als Komponist entwickelte er eine eigenständige Tonsprache, die eine breite Palette klassischer Gestaltungsmittel, traditionelle bulgarische Musik und neueste zeitgenössischen Entwicklungen einschloss—bisweilen auch mit einem visionären Blick in die Zukunft. Zu seinen bedeutendsten Kompositionen zählen zwei Sinfonien, ein Klavierkonzert, die beiden Oratorien Weihnacht und Thrakien, die Rhapsodische Fantasie und Vier Skizzen für Orchester, einige Gesangszyklen sowie eine Sonate, Toccata und Kino-Suite für Klavier; zahlreiche Werke blieben unvollendet. Als 1944 in Bulgarien der Kommunismus an die Macht kam, kam Dimitar Nenow in eine sehr unvorteilhafte Lage. Er stammte aus der Familie eines Generals der Zarenarmee; das machte ihn automatisch zur verdächtigen Figur. Hinzu kam seine Ausbildung und die Zeit, die er im europäischen Ausland verbracht hatte. Nach seinen Anfängen als Klavierschüler seiner Mutter und des berühmten bulgarischen Pianisten Andrej Stojanow hatte er in Dresden Architektur, Klavier, Musiktheorie und Komposition studiert, dann in Bologna Architektur und Klavier und wurde schließlich Student des Busoni-Schülers Egon Petri in Polen. Er hatte den ganzen Kontinent als Solist bereist und einige Jahre in Dresden als Musikdirektor einer Balletttruppe gewirkt, bevor er in den letzten Jahren des Königreichs Bulgarien in seine Heimat zurückgekehrt war, um als Musiker und Architekt bedeutende Positionen zu übernehmen. Mit dieser verdächtig bourgeoisen Vergangenheit nicht genug, schrieb er auch nie eine Note zum Ruhme der Kommunistischen Partei, womit er unter den wichtigen bulgarischen Komponisten seiner Zeit eine absolute Ausnahme darstellte. Die Folgen blieben nicht aus. Auf den Seiten der Zeitschrift Sowjetische Musik tadelte kein Geringerer als Aram Chatschaturjan Nenow und dessen Rhapsodische Fantasie, denn sie stehe unter dem Einfluss des „westlichen Modernismus“ und zeige „Züge von Impressionismus und Kosmopolitismus“. Zwar gehörte Bulgarien nicht zur Sowjetunion, doch wurden Signale aus Moskau dort oft mit größerem Eifer aufgegriffen als im Sowjetreich selber. Auf Anweisung des damaligen Rundfunkdirektors Nayden Naydenow wurden alle Aufnahmen Nenows beim Bulgarischen Nationalrundfunk vernichtet; lediglich beim Ungarischen Nationalrundfunk hat sich eine Aufnahme des Solisten Nenow von Liszts 2. Klavierkonzert erhalten. Nur durch Zufall entging die autografe Partitur von Nenows Oratorium Weihnacht beim Bulgarischen Nationalrundfunk dem Schicksal, verbrannt zu werden. Sein persönliches Archiv wurde „bereinigt“, und etliche erhaltene Werkmanuskripte und persönliche Dokumente weisen willkürliche Eingriffe auf. Nach der ersten, radikalsten Phase des Regimes erlebte Nenow so etwas wie eine Rehabilitation—er bekam ein Jahr vor seinem Tod sogar den staatlichen Dimitrow-Preis verliehen. Doch hatten die jahrelangen Anfeindungen und Demütigungen zweifellos Spuren hinterlassen, und als er 1953 starb, verfielen der Komponist und Mensch Nenow einem klammen Schweigen. Bis heute sind seine Kompositionen außerhalb Bulgariens unbekannt. Nach der Teilung Europas spielten westliche Orchester keine Musik bulgarischer Komponisten mehr. Zuvor hatten Werke von Wladigerow, Pipkow, Goleminow und Nenow bei vielen auf dem Programm gestanden, auch bei den Berliner und Wiener Phiharmonikern, dem London Symphony Orchestra und dem Philadelphia Orchestra. Ein halbes Jahrhundert lang führten Orchester östlich des Eisernen Vorhangs gelegentlich bulgarische Musik auf, doch die Werke Nenows spielten ausschließlich in Bulgarien selber eine Rolle, denn sie galten als „ungeeignet“, das Land im Ausland zu vertreten. Bis zum Zusammenbruch des Kommunismus 1989 blieb es dabei. Dieses Album enthält zwei von Nenows größten und repräsentativsten Werken, die hier beide erstmals für den Tonträgermarkt eingespielt wurden; vorher existierten lediglich Aufnahmen des bulgarischen Rundfunks. Das Royal Scottish National Orchestra ist das erste nicht-bulgarische Orchester, das Musik Nenows eingespielt hat. Angestoßen wurde die Aufnahme von dem in London lebenden bulgarischen Pianisten Ivo Varbanov, dem Solisten der Aufnahme. Die Erstellung von Orchesterstimmen und Partituren gab der Pianist eigens für die Aufnahme in Auftrag—die Werke sind unveröffentlicht, und alle früheren Noten waren handgeschrieben. Das Klavierkonzert von Dimitar Nenow, vollendet 1936, wurde im Jahr darauf in Belgrad mit dem Komponisten am Klavier erstmals aufgeführt. Es ist ein monumentales Werk, das im Hinblick auf die Sonatenform und thematische Entwicklung an die Grenzen dessen geht, was die klassische und romantische Musik erreicht hatten. In einer ästhetischen Symbiose spätromantischer und frühmoderner Entwicklungen verbindet es beide mit den modernen Richtungen der Objektivität und des Konstruktivismus; zugleich ist es auf subtile, doch erkennbare und persönliche Weise durchsetzt mit der Melodiesprache der bulgarischen Volksmusik. Statt hier bloß das Soloinstrument vor einem orchestralen Hintergrund auszustellen, integriert dieses virtuose Konzert den Solopart in ein sinfonisches Ganzes, ganz wie die Klavierkonzerte Brahms’, Rachmaninows und Bartóks. Während der Solopart sich auf die Traditionen von Instrument und Gattung bezieht—darunter die Klavierkonzerte Beethovens, Brahms’, Rachmaninows, Liszts, Skrjabins und anderer—, greift er zugleich neue Entwicklungen auf: Polymodalität und Polytonalität, Klangfelder und Tontrauben, perkussive Effekte und Jazz-Anklänge. Das Werk ist in einem durchgehenden Satz gehalten, der sich in drei Abschnitte unterteilen lässt. Damit zitiert es das herkömmliche dreisätzige Klavierkonzert ebenso, wie es in seinem Aufbau seltene und neuartige Elemente erprobt. Der erste Teil beginnt mit einem ekstatischen Thema, das im weiteren Verlauf eine herausgehobene Rolle spielen soll. Angelegt als Sonatenform ohne Reprise, zeigt dieser Abschnitt einen Grad von Freiheit, wie er eher einer Rhapsodie oder Improvisation entspricht. Dem Hauptthema tritt ein sehr einfaches zweites Motiv im lydischen Modus gegenüber, das auch den zweiten und dritten Teil des Konzerts durchziehen und damit zur zweiten thematischen Hauptgestalt des Werks wird. Der zweite Teil ist eine lyrische Meditation über das bulgarische Volkslied Я разтуяй, цвето моме, магиите („Brich den Zauber, o Jungfer Zveta“), ein trauriges Lied von unerwiderter Liebe mit typischen und eigentümlichen Elementen des Landes, etwa den charakteristischen modalen Modulationen und der „metrumlosen“ Melodie, die frei von metrischen Zwängen fließt. Dieses Thema wird einer konsequenten Entwicklung in mehreren Variationen unterworfen, die sich oft weit, ja bis zur Unkenntlichkeit vom Original entfernen; etwa im Brahms’schen Choral des Soloklaviers mit offenkundig liturgischen Anklängen, im dazu kontrastierenden bedrohlichen Militärmarsch und in mehreren tanzartigen Episoden. Die große Vielfalt dieser Variationen, die alle auf einer einzigen Volksmelodie beruhen, zeugt von Nenows schöpferischer Fantasie und überlegenen Kompositionstechnik. Der dritte Teil des Konzerts kommt einem Scherzo-Finale nahe; sein launiges Thema variiert frei, aber erkennbar das Anfangsthema des ersten Teils. Das Ganze gipfelt in der Wiederkehr des eingängigen Chorals aus dem zentralen Adagio-Abschnitt, hier sieghaft als feierlich-ekstatischer Höhepunkt im Orchestertutti. Die träumerische Coda, die an feierliches orthodoxes Glockengeläut erinnert, kombiniert Motive aus den drei Hauptthemen des Werks, den beiden Motiven des Anfangs- und dem Volkslied des Mittelteils. Der gesamte, durchgehende Satz des Klavierkonzerts bildet also eine einzige, alles überspannende Sonatenform gigantischen Ausmaßes, die an Breite selbst jene von Bruckner oder Mahler übertrifft. Deren Sinfonien sind zwar im Ganzen länger, setzen sich jedoch aus Einzelsätzen zusammen, einige davon in Sonatenform. Das Klavierkonzert dagegen ist als eine einzige, fast 45 Minuten umfassende Sonatenform angelegt. Eine solche gewaltige, kathedralartige Anlage überrascht vielleicht weniger, wenn man bedenkt, dass ihr Komponist auch Architekt von Beruf war. Die Ballade Nr. 2 für Klavier und Orchester, komponiert 1942/43 und posthum von zwei Schülern Nenows, dem Pianisten Todor Kjuwljew und dem Dirigenten Iwan Bakalow, uraufgeführt, hielt der Komponist selber für sein „bulgarischstes Werk“. Das Stück beginnt mit einer träumerischen Einleitung, die an ein nachdenklich-pastorales bulgarisches Volkslied erinnert. Eine farbenreiche Rhapsodie schließt sich an, die einer klaren dreiteiligen Form folgt. Die Rahmenteile dieser Rhapsodie sind durchtränkt von der zwar stilisierten, doch unverkennbaren Atmosphäre bulgarischer Volkstänze, im Charakter von fröhlich und scherzhaft bis hin zu ausgelassen und rau. Den Kontrast bildet die heitere Ruhe des schönen Mittelteils, der an die Einleitung anknüpft, sich dann aber auf einen überwältigenden, leidenschaftlichen und monumentalen Höhepunkt steigert—vielleicht in Anspielung auf die ruhelose Geschichte Bulgariens und seinen Widerstand gegen die osmanischen Gewaltherrscher, Gegenstand vieler Volkslieder und Balladen aus dem 19. Jahrhundert, die Nenow wohlbekannt gewesen sein dürften und ihn womöglich inspiriert haben. Zwar verwendet er in den drei Hauptteilen der Ballade eine Anzahl gegensätzlicher Themen, doch entstammen sämtliche Themengestalten und Motive des Werks der schlichten Volkslied-Melodie der Einleitung, gleichsam dem Samenkorn, aus dem ein Baum emporwächst. Die scheinbar frei-rhapsodische Fantasie entpuppt sich als intensiv durchdachte monothematische Komposition—eine weitere stringente Neuschöpfung des Komponisten und Architekten Nenow.